As you know, I've come to really like the activities director, Linda, at my mom's new nursing community. It takes a really special person to work with and engage seniors with severe memory issues like my mom. She is so kind and patient and sincerely cares for the residents. On one of my visits with my kids over the summer, I asked my kids if maybe they would consider playing their instruments for the residents on my mom's floor. I imagine the activities directors are always looking for something new and different to entertain the residents. They agreed they would do it, so I asked Linda if she would be interested in having them. She was excited at the prospect and we came up with a recent Sunday as one of the few days all of my kids were available. The afternoon of Sunday, October 19th we all headed over to hear the kids perform. My kids were not thrilled that I wanted them to wear their marching band uniforms, but in the end they did as I know the residents were impressed and appreciated it. Considering there are only about 20 residents on the floor, we had a pretty good turnout! and, of course, pose for a picture with their Grandma! I was glad my mom had the opportunity to see her grand kids perform as she has not been able to make it to their concerts in recent years. I think my kids also realized what a great thing they did -- giving some of their time to spread some joy!!! My mom had a bit of a hard time keeping her eyes open during some of the music, but she did enjoy it and the attention from the other residents and staff about her grandchildren. The activities director invited them back to play Christmas music in December. I hope we can do it, but I know things will be incredibly busy for all of us. We will definitely try to make it work!! In other news, my brother was able to deliver my mom's lift chair to the seating area on my mom's floor. You may recall her first room was too small for her beloved chair, but I recently got the staff's approval to move it into the common seating area near the tv. I bought a new cover for it, and I am hoping she will enjoy it as much as she used to!!! Things continue to go fairly well with my mom. On a recent perfectly beautiful Fall day, I was able to visit on a weekend since my husband and our kids took our exchange student to Cedar Point. It was a good day for me to catch up on lots of things. I finally found my way to a different part of the "grounds" at the community where my mom is living. It was soooo nice!! I regret that we had not had the opportunity sooner. I also am slowly becoming more familiar with the staff and procedures and things. There are alarms that go off and codes to learn when using the elevators and exits, especially on the memory care floor. I've also learned I only need to "sign her out" if I'm leaving the grounds of the community. Did you spot the real live green frog sunning himself in the middle picture!? So cute! I pointed it out to my mom. I think she saw it -- she said she did! Just sitting there in the peace and quiet may have been better for me than my mom, but I'm sure the fresh air did her good, too. Unfortunately, as is often the case, she was falling asleep quite often. I felt like I was trying to force her to stay awake so I took her back inside so she could rest. this recent picture of my mom and "Steve" the dog back by the lake at her nursing community. is not always the best as my mom tries to feed me, and I'm a distraction to her eating. Also, she has been very sleepy lately. The CNA in the background is Stephanie. She's my favorite along with Linda, the activities lady. some of the residents. I found this picture hanging in my mom's room. So sweet. From what I understand, my mom colored a bit, but was also having a sleepy day. On October 16th the community staff scheduled a "care conference" with me. I had heard that they would do this and I think they are supposed to do so once she has been there three months, which she has (almost four now). I decided to knock another item off my list, so I arrived shortly before our 10 am hair appointment. Stephanie was just taking my mom for a shower after breakfast. I told her I had scheduled a last minute hair appointment for my mom in the building. She was, again, long overdue for a cut!! Stephanie had her dressed and showered in less than 15 minutes which is quite amazing if you ask me!! 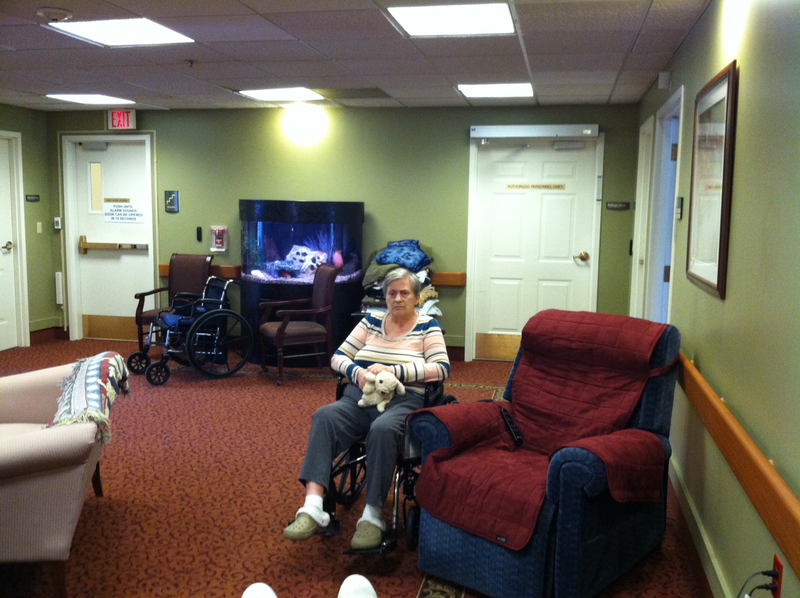 The salon was very busy with residents and asked if we could wait a bit so we went down the hall to the Café. This is all located on the "Main Street" area of the community which is located between the assisted living and skilled nursing. There was a Detroit Free Press newspaper there so I gave it to my mom. She used to get that paper EVERY morning and go through the whole thing. On this day, she did read a few headlines. I think she would do better with reading glasses, but sadly those days seem to be gone. When I went to check on my mom, she was not quite done. I noticed there was a man who volunteers and takes the residents back to their rooms or picks them up for their appointments. Because of the delay at the salon, my care conference appointment time was getting closer. Ultimately, I had to ask if they could bring my mom back to her room so I could make my conference time. This made me a little nervous, but I didn't have much choice. There were four people at the care conference. A social worker, activities director, nurse and I'm not sure the other girl's title. These meetings are scheduled for only 15 minutes so I knew there wasn't going to be too much time. I let them talk as much as I could but at one point when the nurse said "we have noticed a decline in your mom since she's been here" I got teary eyed!!! Darn it! I don't know if there will ever be a day when I am "used to" this... I honestly think I could handle things better if I wasn't always by myself! They told me some physical areas of decline and indicated there have been several days recently where they needed to hand feed her. On the positive side, they said she engages in all of the activities and she is in the "Top 3" of their trivia games. The girls also seem to enjoy my mom and her sense of humor which is mostly still intact. I also learned that as much as they do for my mom, there are still areas where I need to be vigilant. Some blood work that needs to be done periodically to monitor my mom's medications, dental checks, podiatrist appointments... It appears those things have not been done even though when I said I wanted those done when I was asked about it when she moved in. This is a bit disappointing only because I question if her appetite and eating changes could be due to some dental issue. I also questioned my mom's more sleepy state recently and asked if she is sleeping at night. The only thing they were sure of is that she stays in bed....but not sure if she is actually sleeping. So, they were going to do a "sleep study" on her to see. The first night she only slept about half of the time, the second night she slept through the night. I will be following up on that soon. As you will recall, I went through this day time sleepiness with my mom before. Although it is not at all unusual for someone with my mom's health to be sleepy, it obviously is going to be much worse if she has her days and nights a bit reversed much like a baby would. There are many similarities between my mom's aging and the behaviors of a baby or young child. After the meeting, I went to see my mom and how her hair turned out. She looked good -- although I am still getting used to the gray. I have gone back and forth about keeping up the coloring of her hair, but have decided and been advised to let her go au naturale. Unfortunately, I did not take a picture of her hair since she was eating lunch when I saw her. I said my goodbyes to my mom, and I went back to the salon to pay. I was surprised to learn the salon is not allowed to accept tips! I think we will be using their services more and more, particularly since it appears I do not always have to be there. I left that day with mixed feelings. I felt good about getting a lot of things discussed and taken care of, but also the realization that all of my efforts and some sugar coating cannot change the direction of my mom's health. I know I keep saying it, but things sure are busy around my house lately!! Our German exchange student has been with us two and a half weeks so far and on Friday the group will be heading back to Germany. Having four teenagers has kept me busy, but I am grateful to be able to focus some of my time on them. Having my mom settled into her new home has allowed me the freedom to do this, although it is still bittersweet. I am hoping this is my last "catch up" post, so it is a bit "picture heavy" as I wanted to include all of the visiting I have done since my mom was moved onto her "memory care" floor as I wrote about here. The quality of visits is much better now that there is actually more room to sit and visit with my mom. She is rarely in her room as the staff seems to make certain that the residents are engaged and in the common areas of the floor where they can participate in activities, watch TV, sit with the cats, watch the birds or fish aquarium, or socialize with each other. On one visit I found my mom sitting here and watching TV in the commons area. She also seems to like the table of "community" blankets that are there for the residents to use at will. I often find some of them in her room. On another recent visit I was surprised to find the residents gathered to learn and talk about baseball. The area was decorated in a Detroit Tigers theme and there was actually an umpire standing there with the activity director and discussing various things about baseball... They passed around equipment, discussed different baseball terms and then the umpire demonstrated some of the signals that go along with those calls. It is this next part of the story that I should probably leave out -- but I will not because then I wouldn't be "keeping it real" as I try to do. I should also mention that all three of my kids happened to be with me on this visit. We quietly stood back and listened as we did not want to distract the residents from their activity -- and then it happened. The umpire demonstrated his signal for "YOU'RE OUT" by raising his thumb and motioning back. He then asked if anyone knew another hand signal for "YOU'RE OUT"!!?? It was then that my dear mother raised her middle finger and waved it in the air.............. Thankfully, it appeared only me, my kids, and the umpire noticed what she was doing. The truth is, me and the kids were doubled over laughing and trying not to laugh at the same time. That is my mom's sense of humor. I was not one bit surprised and yet I was still mortified!! Another moment me and the kids will probably never forget!! On another evening, I was near my mom's place and I decided to make a nighttime stop to see what goes on at night. I was wondering if my mom would be in bed and thinking she would be, but I just wanted to peek in and see if and when she sleeps. I know it was after 8 pm when I got there, and I was surprised to find a group of the residents all gathered around the TV watching the Tigers game... They did have their pajamas on, but there they were having their own little PJ party gathered aro﻿und the TV. It was pretty cute!! I sat with my mom for awhile and we talked about the Tigers and she seemed glad I was there. At one point, the staff also brought her a bedtime snack -- these cute little mini Teddy Grahams. She was a happy camper, and I felt pretty good about what goes on there at night. My mom has always been a "night owl" and she still is. They always post the activities in the residents rooms, and I keep a photo of the calendar on my cell phone for reference. They do a great job from all that I have seen. Occasionally, my brother Mike sends me photos like this. He took my mom out by the lake in the back of the senior community. That way, my mom gets to visit with her "granddog" Steve. I will have to do the same sometime soon with her other granddog "Lucky". realize people are thinking of her. When Kristin's busy schedule allows a visit, she still has a way with her Grandma and I know Grandma appreciates seeing her smiley face!! All my kids also love the cats -- this one is "Sugar"! On another visit, I brought a family newsletter from my mom's cousin. At this point, I think she mostly enjoys the photos, but she does try to read a bit of it, too. She lives vicariously through their adventures and world travels! Recently, I arrived to find the residents again gathered around this nice man who sang and played the accordion for the residents. He would start playing some music and then wait to see if any of the residents recognized the tune. Very often someone does, and then they join in and sing along. Other times, he gave clues and more often than not several of the residents would know the songs as they tend to be from the "good ol' days". While I was there, he told me my mom liked this song...and he played a song using my mom's name "Mary" in it just for her. I have learned to join in and help "prompt" my mom when I arrive during these activities, after all it's the least I can do. If I can help my mom or one resident make a connection then all is well!! What a relief to see that my mom engaging in the activities, and I know Linda, the activities director, has personally assured me that she makes sure my mom participates in everything she can. I no longer have images of my mom sitting alone in her apartment with nothing to do and nobody to talk to. This is all I can hope for and gives me some peace of mind.